Andhra Pradesh Education Common Entrance Test(AP EDUCET). Sri Venkateswara University regulates AP EDUCET. AP EDUCET will be conducted for Students who have completed their Graduation or pursuing Degree. Candidates Intend can apply Online for EUCET. We provide you with clear information about AP EDCET Results. The AP EDUCET Results will be declared after the examination. The candidates can check for AP EDCET Results at sarkarirecrutment.com. The AP EDCET Results helps Students to know the status of their Exam and to plan accordingly. Sri Venkateswara University is about to release exam result of the Andhra Pradesh Education Common Entrance Test(AP EDUCET) 2017. The examination was held in the month of May 2017. Sri Venkateswara University is one of the fame University in the country. It conducts the Andhra Pradesh Education Common Entrance Test(AP EDUCET). Candidates who had given examination can check their examination result from the official website of the University. Further candidates can also get timely updates at our site. Sri Venkateswara University, Tirupati, is established in 1954 in the world famous holy temple town of Tirupati on the sprawling campus of 1000 acres with a panoramic and pleasant hill view. The University stands as a testimony to the wisdom and foresight of great visionaries Late Sri Tanguturi Prakasam Pantulu, the then Chief Minister of Andhra and Late Sri Neelam Sanjiva Reddy, to cater the educational needs and aspirations of the people of Rayalaseema area. With a great wisdom, the founder of this University has rightly coined the motto Wisdom lies in proper perspective for it. The University has grown excellently from strength to strength over the past 60 years, as a premier institute of higher learning under the able and committed leaderships of successive Vice-Chancellors starting from Prof. S. Govindarajulu to the present Vice Chancellor Prof. Avila Damodaram. It has gone through greater strides in the transformation of the University with acquiring necessary and modern sophisticated instrumentation to catch up with the world competition in academic and research programs. 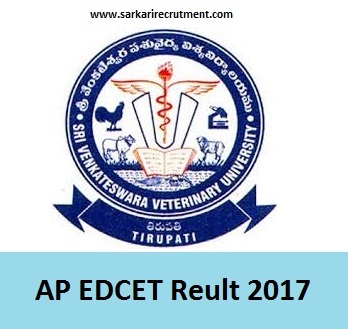 Sri Venkateswara University has invited online application form for AP EDCET 2017. Interested and eligible candidates can submit their application form through official website. Details of notification are mentioned below. Sri Venkateswara University is going to release Andhra University Common Entrance Test (AUCET) Result 2017 shortly. Candidates who given the exam are eager for the Result. They can check their result at the official website of the University. They can also check our site as we update you with Timely updates. The applicants should belong to India. The candidates need to satisfy the local or nonlocal status requirements that have been laid by the council. The students appearing for the entrance exam should have passed B. Com or B.A. or BCA or B. Tech or B. Sc or B.E. or B. Sc (Home Science) or BBM. The final year candidates can also apply for the entrance exam. Candidates need to secure at least 50% marks in aggregate is required to appear for the entrance test. The B. Tech or B. E. candidates with Science or Mathematics as their compulsory subject are also eligible for the exam. Those applicants belonging to reserved category, then the minimum marks that they need to achieve is 40%. Check for AP EDUCET Result 2017.